Every piece is unique—this is what the new renditions of the TAG Heuer Aquaracer promises as each get a random injection of carbon-fiber into a resin pressed at high temperatures. The result is a blackened case and dial mottled with gray spots and streaks. 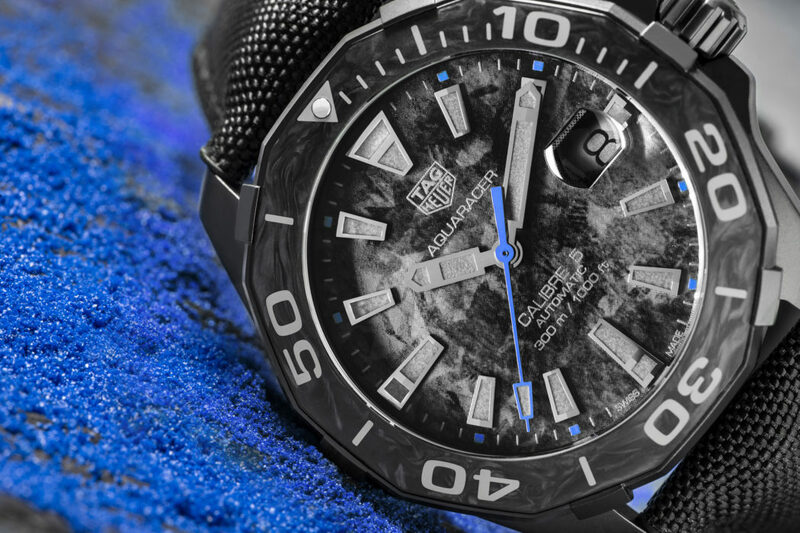 TAG Heuer correctly points out the pattern “evokes the depths of the oceans,” or, at least, depths of 300 meters (the watch’s water-resistance rating). 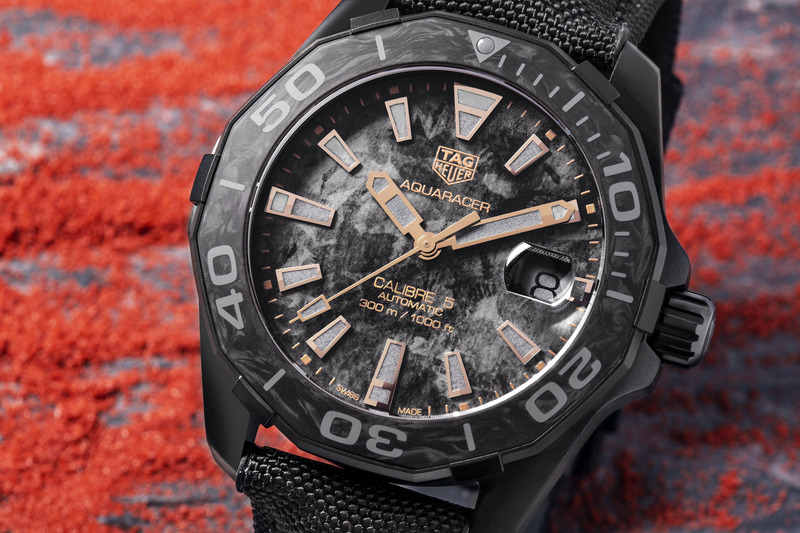 The Carbon Aquaracer, as the watch is called, is now available exclusively at TAG Heuer boutiques and through the brand’s website (tagheuer.com). It comes in three models, all sharing the same carbon motif but accented by either blue, yellow or rose gold hands and markers. All are also housed within a 41-millimeter, black PVD-coated, grade 5 titanium case with the Aquaracer line’s beefy, 60-minute scale, unidirectional-rotating bezel made from carbon and steel. The dial gets an imitation carbon effect, on the surface of which reside indices coated with Super-LumiNova. The sapphire crystal on top of these elements is non-reflective, and has a magnifying glass for the date window. The opposite side of the watch is sealed by a black PVD screw-down caseback. A black textile strap, whose stitching corresponds to the color accents on the dial, and which has a grade 2 titanium buckle, fastens the watch to the wrist. 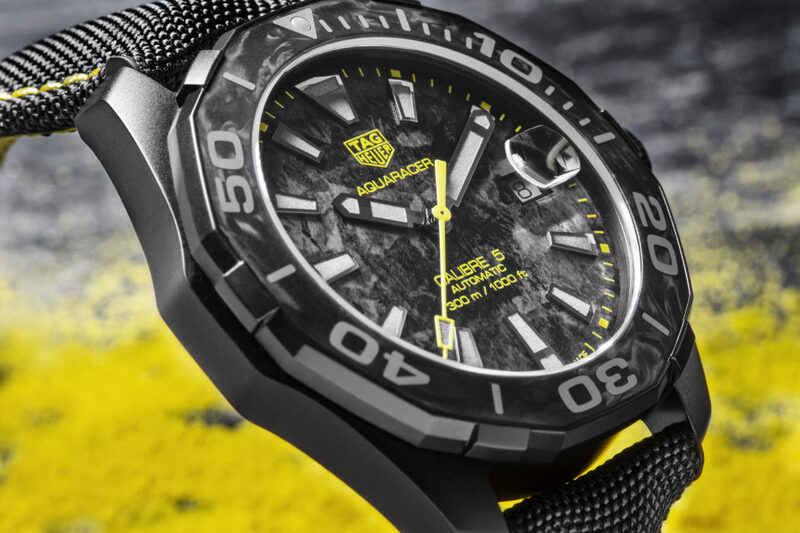 Without doubt, the Aquaracer remains very much a sports watch. Within the carbon-lavished watches ticks TAG Heuer’s self-winding calibre 5, based on the ETA 2824-2 (in some cases this calibre can be based on the Sellita SW200, too). It has a 42-hour power reserve and spins at 28,800vph. 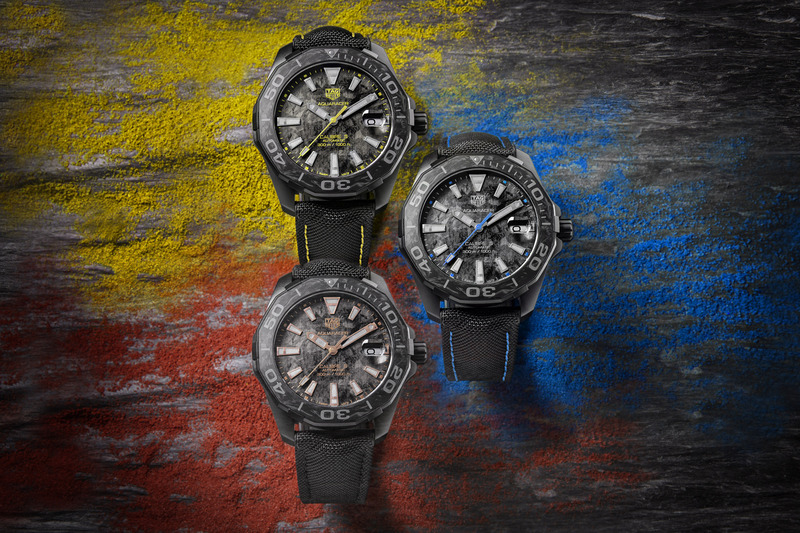 Of course, the Carbon Aquaracer trio’s release was heralded by that of TAG Heuer’s Monaco Bamford, announced earlier at this year’s Baselworld. A special rendition of the Monaco Calibre 11, the piece was the result of a collaboration between TAG Heuer and Bamford Watch Department, and which fuses the “McQueen” dial with a patterned carbon case. Now sold alongside the new Carbon Aquaracer pieces, the Monaco Bamford will serve as the model for other pieces in the TAG Heuer collection. One could say that’s expanding the brand’s carbon footprint.